Cropping images is a common task and an everyday routine for producing content. We believe image crop should happen right in your browser and be intuitive and simple. Firing a dedicated image editor to do the cropping is an overkill. This tutorial is about enabling your users to crop images in any browser with Uploadcare, no matter the device or browser they use. In case you don’t have an Uploadcare account, Sign Up for one. Once you get it, navigate to your dashboard to create a new project or discover API keys for an existing one. You will only need the Public API Key that points to a target project where the images will go to. 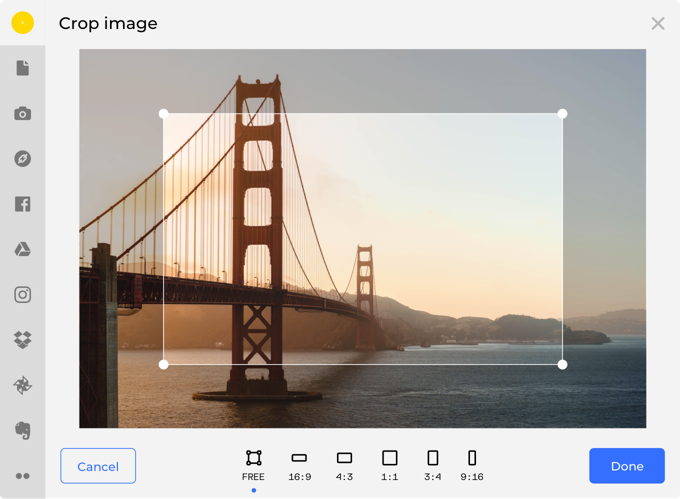 Pick a form in your web app where you want users to crop images. It could be a profile editing form, image upload form, etc. Note, our widget enables your users to upload images from their camera, social media, cloud storage, and more. We call those “Upload Sources,” and you can learn more about them in our docs. You install the widget by adding a couple of <script> elements to your page <head>. It comes in a variety of bundles and is usually served from our CDN. The widget looks for inputs with role="uploadcare-uploader" and places its button there. Note, the value attribute may either be empty or contain a CDN URL or UUID of an image on Uploadcare. The non-empty value will preload a file into your widget dialog. Otherwise, your users will be prompted to load a file from one of the enabled Upload Sources. You can learn more about default files in the widget dialog in our docs. Once you’re done cropping, your image CDN URL gets updated with the crop Image Transformation. The widget then passes the updated CDN URL to the input value, and from there you can use it for other routines. You can define the widget crop presets by specifying the data-crop attribute. This is useful when you want specific aspect ratios, image dimensions, etc. You’ve just enabled image crop in your app via Uploadcare without breaking a sweat. Great job! If you’d like to customize the widget to your app’s look, check out the docs section on widget styling. Our widget is open source, here's its GitHub repo. Issues and PRs are welcome.